I was lucky enough last night to attend the launch in the Abbey theatre of Professor Anthony Roche’s latest book The Irish Dramatic Revival 1899-1939. Professor Patrick Lonergan of NUIG, who edited the book for Bloomsbury Methuen Drama, gave a generous introductory speech; noting as an undergraduate in UCD in 1993 he had been struck by the way Roche presented his lectures as if he’d just rushed from a good play either in the Gate or in UCD Dramsoc’s LG theatre and was eager to tell his students about it so they could experience it too. Indeed Lonergan claimed that he remembered lectures Roche gave then more vividly than lectures he’d heard in the last month. Roche’s interest in, and support for, UCD Dramsoc was attested to by the presence of former students Caitriona Ennis, Caitriona Daly, and Eoghan Carrick, now rising stars of the Dublin theatre scene as the founding members of We Get High On This theatre company. Fiach Mac Conghail, the artistic director of the Abbey, praised Roche for inscribing performance into the study of the Revival. Yeats may have prioritised a literary theatre, but he still needed actors to speak his words, and Mac Conghail noted that without the Fay brothers and the Allgood sisters the early Abbey would not have succeeded. He also noted that Roche had a telling eye for gossip in detailing the power struggles by which Yeats managed to subvert a democracy of actors and writers, and instead form a smaller unit; centred on himself; who decided what plays to perform and who to cast in them. Mac Conghail observed that questions of art and commerce as were laid bare in the book still beset the current Abbey board, and that the duality of the theatre was captured by the term ‘show-business’. Mac Conghail also praised Roche for matching his prioritisation of the collaborative nature of the Abbey repertory players and the Abbey writer/directors with a reinstatement of the influence on the Abbey writers, particularly JM Synge and Sean O’Casey, of Henrik Ibsen; a reinstatement practised in the Abbey’s current season which deliberately followed a new version of Hedda Gabler with a revival of The Shadow of a Gunman. Mac Conghail also promised that Shaw would return to the Abbey at Christmas (Which Shaw? Wait and See), and praised the work done by Roche, as well as Frank McGuinness, in writing Shaw back into the narrative of the Revival; ‘The Absent Presence’ as Roche’s chapter dubs him. Roche launched the book officially by noting that Bloomsbury’s offer to write a book accessible to general audiences gave him a chance he’d been waiting for – to tell the long narrative of the theatrical Revival. 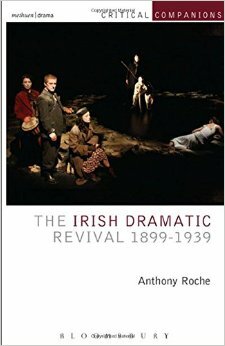 The Irish Dramatic Revival: 1899-1939 by Professor Anthony Roche is published by Bloomsbury Methuen Drama.